One of the easiest ways to tap for an issue is by using the storytelling or movie techniques where you are tapping and working through the basic facts of the story. It can be harder to tap on your own when you don’t have a specific story to tap on. When we feel an emotion strongly but it is not attached to one particular event or situation, it can be hard to find a story to tap through. 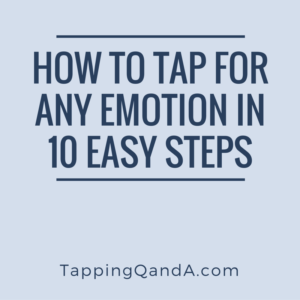 Here is a simple process you can use to tap on an emotion when you are in this position. This is also an excellent tool to use when you are teaching someone to tap. If you follow these steps, writing your answers out on a sheet of paper, not only will you have a successful tapping session, but you will also end up with a tapping script that you can use again. This seems like an obvious first step, but sometimes we don’t name what we are experiencing in detail. 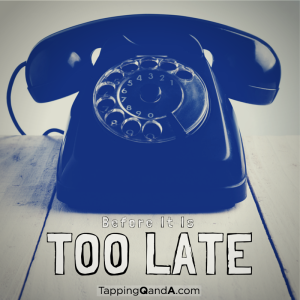 The more detail we have, the more effective our tapping will be. There is a difference between anger, rage, and betrayal. On the surface we might simply say we are mad, but as we investigate more thoroughly, we can see the subtleties to the emotions we are feeling. The Center For Non-Violent Communication has come up with a great list of emotions. Print this out and read it over. It will help you to tune into what you are feeling in detail. In as much detail as you can come up with, describe one specific occasion when you felt this emotion. Talk about who was there, what was said, what you were thinking at the time, what you are thinking now as you remember it, and all the outcomes of the situation. Imagine you are sitting across from me in a coffee shop and telling me what happened as if I know none of the details. On a scale of 0 to 10 rate how large the emotion feels right now. SUD stands for “Subjective Units of Distress” and the SUD Scale is a subjective rank from 0 (no emotion at all) to 10 (overwhelmed by the emotion to the point it is all you can think about). Describe the physical sensations that go along with the emotion in as much detail as possible. In which part (or parts) of the body do you feel it? Is it hot, tight, heavy, itchy, stiff, trembling, clenching, or some other feeling? Do you feel it in more than one part of your body? Describe each part separately. Is there some sort of mental dialogue going on as you feel the emotion? What is the internal voice saying? Who does the voice sound like? Who does it remind you of? Because of the instance you describe above what are (at least) three things that went wrong and how were/are you impacted by these outcomes? Sometimes one moment can impact later events and moments. Don’t just think of what went wrong in the moment, but also how it affected later moments. Again, the more detail you use, the better. After something goes wrong there are ways we would like to see it turn out better. What are (at least) three hopes you have for how this could turn out better in the future? Is there a relationship you would like to see mended? Is there something you would like someone to do? Is there a lesson you would like to learn? It is helpful to name how we would like things to turn out. After doing these steps I always like to re-rate the level of emotion. One of three outcomes are possible. First, the number could go up. This is because you have now spent time thinking about the issue in detail. Often this tunes us into the issue more sharply so that we notice it more, making it feel bigger. Second, you might notice that the number goes down. Many times simply getting something out of your head will be enough to diminish its intensity. Our minds can be relentless echo chambers, taking negative thoughts or emotions and bouncing them around over and over again. When we drag them into the light of day they often lose their power. Finally, there might be no change at all. This simply means that the emotion will need more tapping to get it moving. Go back to the top of your notes. Start reading what you have written out loud as you tap. At the end of each sentence move to the next tapping point. This is not a race. There is no reason to rush. As you read what you have written out loud pay close attention to the words you are saying. If you are describing what happened then try to relive what you are saying. If you are describing how you would like to see things turn out in the future, really tune into the emotion of having the new and better outcome. As you reread what wrote before it is possible that additional details will come into focus. You may also notice new and even better outcomes around this issue for the future. If these things come to mind it is a good idea to take the time to write them down. Not only will you learn valuable things about this specific issue, but you will also learn things about yourself and the larger scope of this particular emotion. After you have read through what you have written and have tapped along, re-rate the issue to see where it is now. If you are down to a zero you are done, if you are not then you have the opportunity to move back to the top of the page and tap again. It is possible to feel an emotion, tap in the moment, and feel better in that moment without making any lasting change. By taking the time to tap through your emotion in this systematized way, not only will you feel better in the moment, but you will be working towards lasting change. When I am listening to my clients talk about their issues I am not just listening for the meaning of what they are sharing, but I am also listening to the very specific words they are using. The words we use to describe something will impact the way we understand a situation which then in turn impacts our emotional response to the situation. This week we are looking at another way in which we use language that leads us to respond to our daily experience in ways that aren’t useful. 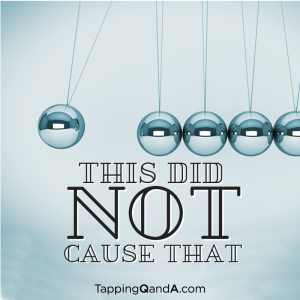 In this article we are examining the words “should”, “shouldn’t” and “ought to”. The problem with these words is that often we give them too much weight. You can see the clear emotional difference between what we mean and what we end up feeling. In all of these examples what we feel will have a much stronger (and often much less healthy) response to what is going on. When one of my clients uses a should, ought to, or shouldn’t I generally ask a the question “What proof do you have that it has to be this way?” Often this is enough to help them to see they are turning an opinion or preference into a fact. When you are doing work on your own and you notice you are use one of these words, try the simple step of replacing them with “it would be my preference”. 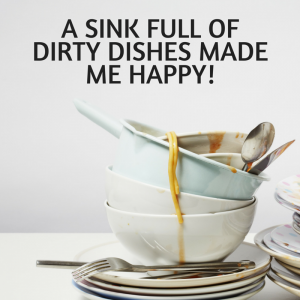 There is still an emotional charge to that statement, but instead of feeling like a failure we feel a little rushed or overwhelmed because of the work we need to do. Even though the second emotion is also negative it is easier to respond to it in a healthier way. There will be some cases where using the word should is helpful and we don’t want to make the substitution. If you are looking for more resources about how to respond to the things you should do check out EFT For Shoulders And Shoulds where Gwenn Bonnell shares a simple tapping process for things you feel like you should do. For this reason I pick apart my clients’ speech pattern to understand what is really going on vs. what they are responding to emotionally. One of the places we commonly make the mistake of using words that do not line up with reality is in cause and effect statements. We use cause and effect statements all the time. (cause) Because I was late (effect) I missed out on the sale. (cause) Because I didn’t return her phone call (effect) she didn’t know I was coming. (effect) I can now legally work with clients (cause) because I passed the certification exam. (cause) I forgot to close the shades (effect) so I didn’t sleep in because of the sun coming in the window. That is not too complicated. The problem comes when we start making statements that aren’t accurate in describing their cause and effect relationship. (effect) Thing went wrong this morning (cause) because it’s Monday. (cause) Smoking (effect) causes cancer. (effect) I don’t have a girlfriend (cause) because the men in my family are bad at relationships. On the surface all three of these statements seem reasonable, but there are logical flaws in all of them which illustrated with a question or two. Thing went wrong this morning because it’s Monday. Do things go wrong every Monday? Do things not go wrong on other days of the week? Smoking causes cancer. Does everyone who smoke get cancer? I don’t have a girlfriend because the men in my family are bad at relationships. Are all men in your family bad at relationships? In all three cases the statements work in absolutes which lead us to react emotionally to situations in a particular way. But when we are able to see the statements for what they are then we are able to react in less emotional fashion. The way that we put this knowledge to use is to question our own statements. If there is something you are struggling with write down a statement that describes what you believe about the situation. Once you have done this start to question it at the extremes. Is it really always this way? Is it really never this way? Does this outcome happen for other reasons? By doing this we can see things more clearly which will help us to respond in a healthier way. Learning EFT can be very exciting at first. 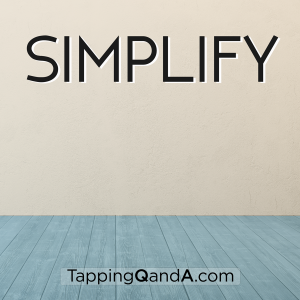 Tapping is so easy. It can be done anywhere! It seems to work for everything! You download podcasts, tapping scripts, and ebooks. You attend online seminars and sign up for programs. You start working on a personal peace procedure (listing every bad memory you have in your life to tap on in turn). You decide you are going to tap for your health, your relationships, your creativity, and getting a better job. It just becomes too much! A number of years ago Andy Hunt wrote an interesting article on his site Practical Wellbeing that has stuck with me. In Self-Hate Speech he looks at the hate speech laws of the UK and asked the question of how would law enforment respond to you if they heard the words you thought about yourself. I don’t know about you, but I am certainly capable of thinking some nasty things about myself. In addition to thinking nasty, hateful things about ourselves, for some reason we also give those thoughts much more weight than the positive thoughts..
You have been there before. You are trying to make a change, like giving up sweets. The first day is hard. The second is harder. The third day, for some unknown reason, is really easy. You feel awesome. You are making progress. Real change is happening. Then it is two, then four, and then the bag is empty and you think, “Screw it! It’s too late!” and you devour every sweet in the house plus some potato chips for good measure. Within moments you’re filled with shame and self-loathing. You wake up the next morning feeling defeated. In more common terms you are in the process of making a change and some part of your system is not getting what it wants, it is royally pissed off, and so it does whatever it can to get what it wants. In our example, the body was expecting a feel good sugar high from sweets. When it didn’t get what it wanted it it turned you into an emotional monster that was willing to eat everything in sight. First, knowledge is power. When we know that something troubling is coming (aka an inflection point) we are much more likely to make a good choice if we have a plan to deal with it. Imagine this is like the fire drill you practiced as a kid at school. If there ever was a fire you would know exactly what to do. Right now my system is throwing a bit of a temper tantrum…It wants its needs met in a way that I know is unhealthy…I know I could easily give in to its needs…And I would feel better for about 7 seconds…But then I would feel really awful and disappointed in myself…I am making choices that are going to serve me in the long term…If I can last through this extinction burst then the habit of making better choices will be stronger…I am stronger than this…And I am worthy of making the better long-term choice. 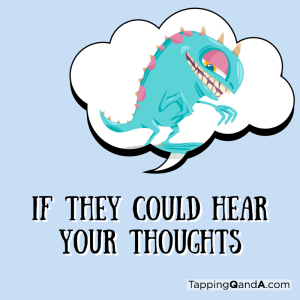 Do you think saying this out loud and tapping is silly? You’re right. But since the first of the year I have effectively fought off donuts, chocolate, and white bread just like this. Second, understand your system is seeking to have a need filled when you are having an extinction burst. As I was working my way off sweets my body was having a hard time because it needed them. In the first 3 days where I completely cut all carbohydrates out of my diet I was having headaches in exactly the say way I had caffeine withdrawal when I cut down on coffee a few months ago. Even when I am tapping for fighting the extinction burst there is still an underlying need for pleasure or comfort or relaxation that requires satisfaction. It’s a good idea to plan how you you can meet that need in another way. When my friend was quitting smoking she realized that part of the reason she was doing it was because she was looking for an excuse to go outside to get away from her crazy co-workers. So when she craved a cigarette she took a walk around the block instead to give her a break from the office. When I was cutting out carbs it was permissible for me to have a teaspoon of all natural almond butter. When the extinction burst showed up and I wanted to eat everything I would allow myself the little treat and it got me through the afternoon. Third, it is important to have clearly defined, measurable stepping stone goals so that you can reward yourself for reaching them as you work towards a bigger goal. For me, I usually experienced an extinction burst when there was some unmet emotional need. I am much less likely to have emotional needs when I am feeling good about myself and my progress. To boost my self-esteem I celebrate my successes along the way. For example, every time I lost another 3 lbs of body fat I would go to one of my favorite places in NYC and take photos. Getting outside, with no work responsibilities, trying to find beauty, and give myself a chance to work on being a better photographer is a real treat for me. By allowing myself a chance to celebrate my successes I was much more likely to have the will to make good choices as I kept working towards my goals. Unfortunately, extinction bursts are something that everyone experiences when they are trying to change a habit. 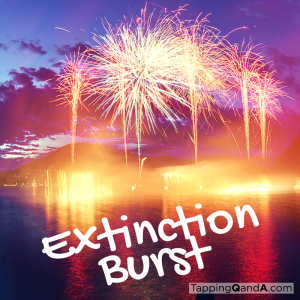 Fortunately, extinction bursts are something that everyone goes through. You are not crazy. You didn’t fail miserably. AND you are not alone. Because this is something we all go through. You will notice the use of the the word “predictable” in the definition above. It is not a matter of if this is going to happen, but when. But with the right planning and preparation we can respond to it in a way that doesn’t derail our goals. If you would like more information on extintion burst you should read this excellent article by David McRaney from his very excellent blog (You Are Not So Smart)[http://youarenotsosmart.com/]. Over the last few weeks my Facebook timeline has been filled with memorials. First, a friend and colleague, Mark, died suddenly of a heart attack. Second, American sports news personality Stuart Scott died from the cancer he had fighting for years. The flood of kind words, memories, well wishes for the families, and stories of learning from the lives of the deceased was amazing. I discovered things about two men I admired that I didn’t know. I was touched to know how the lives of so many were deeply affected because of the admirable way that these two men lived. If you have been reading my website or newsletter for any length of time then I am sure you have read something where I was bragging about my editor. The reason I brag about her is because she is the best! She does more than make sure my dyslexic writing is clear and readable. She really cares about the quality of work that appears on the site. When things are unclear she provides great recommendations. If am writing something that is not quite accurate she does research to make sure I am set straight. If I am behind on newsletter and articles she gently reminds me about deadlines. And so, the goal of perfectly pleasing an infinite number of passersby is a fool’s errand. They come with their own world view, their own issues, their own biases. Not only is this true for a world full of strangers, it is also true for the much smaller group of people in your life. No two people you know are alike, have the same world view, or will be pleased by the same things. Every choice you make about your life risks disappointing someone.